Van Lipzig Tuinderijen is a Dutch commercial cucumber grower, operating on 8.5 hectares. Growing cucumbers on an area that spans about 17 soccer fields, the company grows 240 cucumbers per square meter, and is active between January and November of every year. The company was established in January 2008 in Californië, a development facility which rents greenhouse space to agricultural entrepreneurs on a private basis. Van Lipzig chose to grow at Californië because of the large space it offered, as well as the facility’s high sustainability standards. Cultivation manager Peter van Ninhuys checks the crop-level dew point of cucumbers by monitoring temperature and humidity in combination with object temperature. To capture real-time dew point, a pointed temperature sensor hangs centimeters away from a pointed temperature sensor. 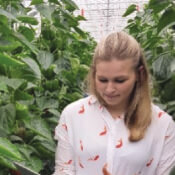 Insights from 30MHz sensors, delivered to the ZENSIE dashboard, help van Ninhuys to optimize conditions in the greenhouses and reduce crop loss from mold and rot. “With 30MHz technology, we’ve started monitoring the temperature of cucumbers— observing how quickly they warm up, and whether temperature falls below dew point. We track these metrics to prevent sunscald and mycosphaerella. In fact, after the first week of sensing, we realized that our tube settings were quite good, and our cucumbers did not have excessive moisture. We also saw an opportunity to lower temperatures and save energy” explains Van Ninhuys.